This is the third installment in an ongoing series about pieces of Central Florida’s theme park history that live on inside fans’ homes or private collections. Have your own to show off? E-mail us at johngregoryFL@gmail.com! The long history of Disney parks contains as many myths as the very fairy tales that inspired Walt Disney. In this case, the very real legend concerns a never-built land of beasts and creatures from the realm of storybooks and fantasy and a statue of a unicorn that some claim was never seen by guests. In fact, it was briefly part of Disney’s Animal Kingdom around the time of its 1998 opening — but now it’s the majestic centerpiece in Graydon Van Ert and his husband’s backyard. 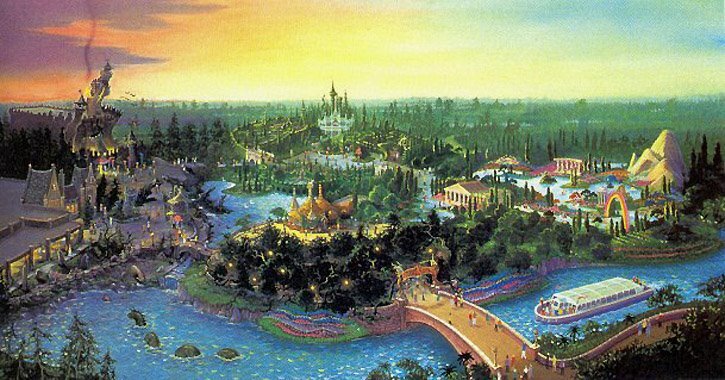 A piece of one of Disney World’s most ambitious unbuilt projects: Beastly Kingdom. Planned to be one of the major draws for Disney World’s fourth theme park, the Beastly Kingdom section was to focus on animals that never really existed. “Like our legends and fairy tales about imaginary animals, this land is divided into realms of good and realms of evil,” read early marketing material for the park. The dark side of the land would have been dominated by Dragon’s Tower, a charred, ruined castle housing Disney’s first suspended roller coaster with inversions. The light side would have featured two attractions: Fantasia Gardens, a gentle boat ride based on the 1940 animated film, and Quest of the Unicorn, a European-style hedge maze that ended with an encounter with an animatronic unicorn. Beastly Kingdom was cut from the Animal Kingdom’s opening day slate due to costs in 1994, according to MousePlanet.com articles written by former Disney Imagineers Maggie Parr and Paul Torrigino. The “temporary” Camp Minnie Mickey area took its place, but the hope was the project would be revived as part of a second-phase expansion of Animal Kingdom. 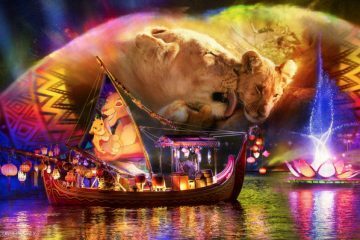 To promote these future attractions, Beastly Kingdom concepts would be previewed on the park’s Discovery River Boats — essentially a boat ride around the park. 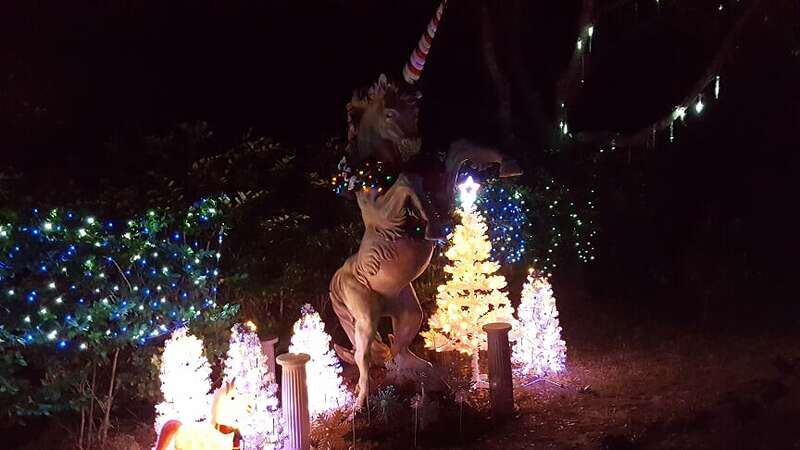 In the area between Discovery Island and Africa where Beastly Kingdom was supposed to be built, boats would pass an eerie dragon’s cave (complete with melted knight armor impaled on a pike) and a statue of a unicorn. At this time, Van Ert was a veteran Disney cast member. Having worked at Disneyland during its 30th anniversary in 1985, he got his start in Disney World attractions in 1990, with his resume including stints at Living with the Land, Horizons, World of Motion, The Great Movie Ride, and being an opening trainer at the Twilight Zone Tower of Terror. Being a Disney World cast member comes with some special perks, including getting an early glimpse at Animal Kingdom. Between cast member previews and the park’s real opening day, the Beastly Kingdom elements on Discovery River Boats were changed at the behest of Disney’s then-CEO and chairman Michael Eisner, according to Van Ert. Gone were the melted knights, deemed too gruesome for children, and the unicorn’s bright white appearance was replaced by an aged look more appropriate to a statue. 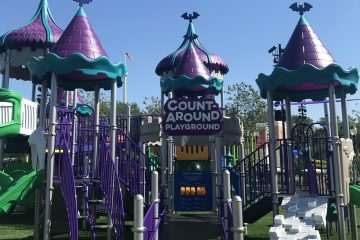 Contrary to some YouTube videos on the subject, Van Ert said the unicorn statue was indeed present for a short time after the park’s official opening, before being permanently removed. 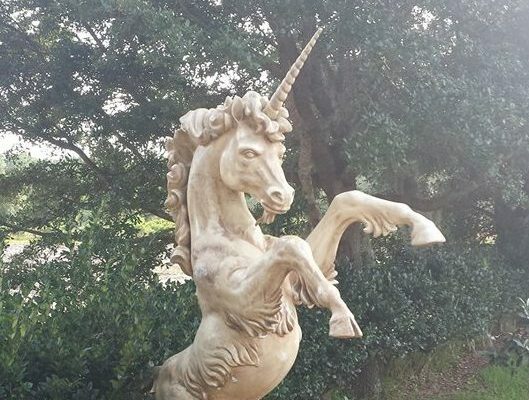 This short existence means few pictures exist of the unicorn statue inside Animal Kingdom. Discovery River Boats would be shuttered altogether in August 1999, partially because of guests complaining that there was so little to see on the ride. Fast forward to 2014, and the land once marked for Beastly Kingdom was being cleared for Pandora: The World of Avatar. Van Ert said the unicorn statue must have been lying around in a backstage area being listed for sale on a cast member-only auction portal. “All it said was ‘This unicorn will surely brighten your day and put a smile on your face,’” he said. His winning bid was only $215, a bargain that Van Ert attributed to the auction site getting the statue’s size wrong. 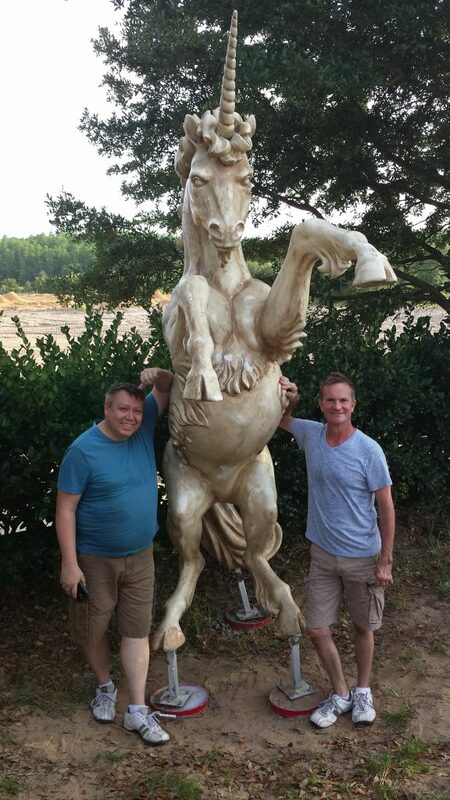 It was listed as only 5 feet tall, when in reality, it stands at over 12 feet tall and 5 feet long from hoof to tail. Unlike some theme park fans that have bought props from Universal Orlando and told their tales to Orlando Rising, no one tried to talk Van Ert or his husband out of this purchase. Being a big fan of fantasy (Van Ert named “The Lord of the Rings” as his favorite book) and having already amassed other Disney memorabilia like a hallway light from Wilderness Lodge and a Tower of Terror lobby elevator call button, he was sold on it from the start. Putting him on display in their backyard wasn’t easy. 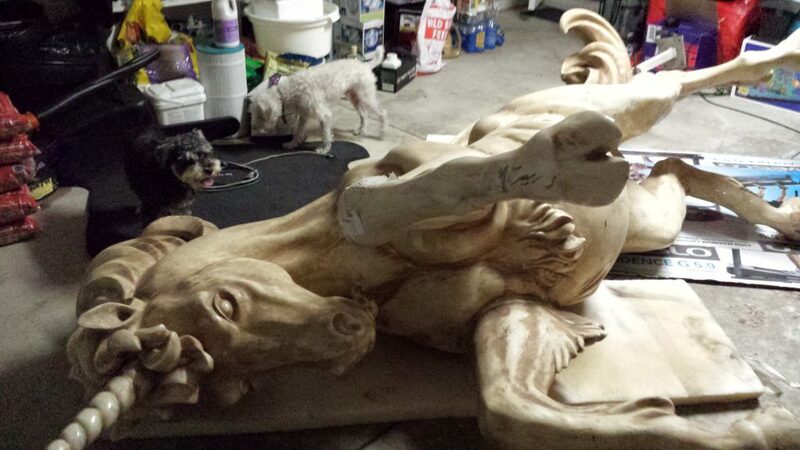 Beastly sat in the garage for months and needed patching to cover scrapes from when he was removed from the park, along with buckets placed into the ground and then filled with concrete to support the statue. For now, Beastly is quite the conversation starter for guests to their home. Van Ert and his husband often decorate the statue for holidays, prominently displayed on Facebook and Instagram pages for Beastly. People have even asked if they can pay to have their picture taken with the statue. “The response has been hysterically funny,” he said. While Van Ert isn’t keen on inviting strangers over to his house, you can see Beastly’s former home at Animal Kingdom, along the old Discovery River Boats route. 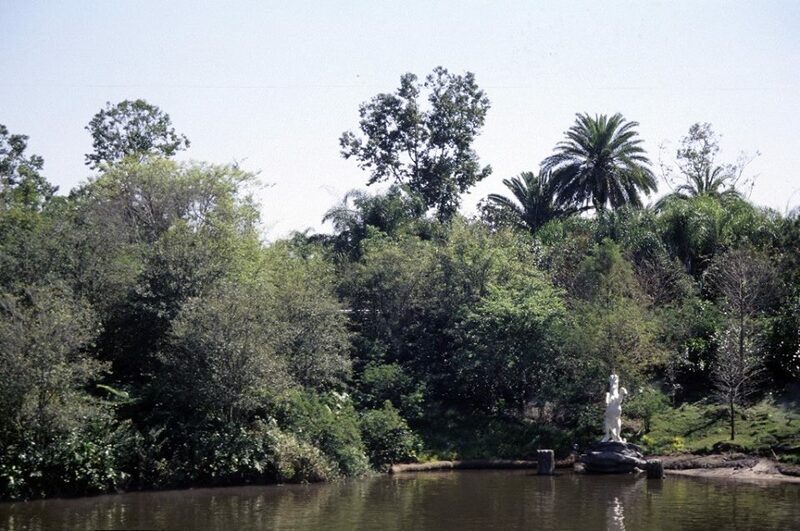 As you’re walking over the bridge heading into Pandora, you can spot the statue’s vacant pedestal on your left. Have your own piece of theme park history you want to show off? E-mail johngregoryFL@gmail.com. 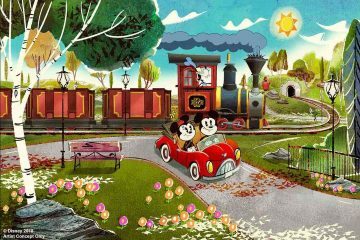 It’s probably not true, but I read a rumor Disney is making their 5th park right next to Animal Kingdom. It will be called Disney’s Beastly Kingdom (possibly Dominion). The lands would consist of a central Dragon section (Discovery Island), an Egypt section (Africa), Australia (Asia), a Stars Wars snow planet (Dinoland) and Fantasia (Pandora).